Our professional team has chosen the most beautiful red rose plant and paired it with the finest wine and delicious treats to make a truly marvelous gift. 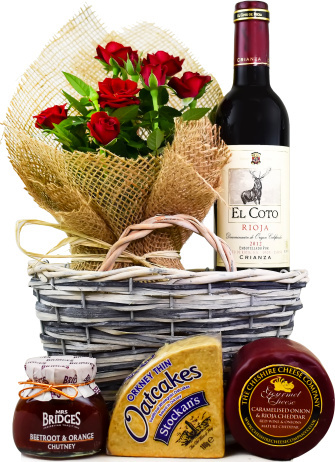 Apart from carefully selecting each item in this wine and rose gift, we also take the time to lovingly arrange everything together in a basket for the perfect presentation. Perfect for all occasions including birthdays, anniversaries, congratulations, and even just because!